Whether it’s the office party, your last day at your job or you’re just feeling especially generous, buying a gift for the whole office can be tricky. You want to aim for something that everyone can enjoy, without leaving anyone feeling left out. Everyone enjoys a bit of a snack during their day at work so something to appease your workmates appetites is something worth thinking about. Sweets are a popular favourite that are easy to share around and are unlikely to fail to put a smile on everyone’s faces. Big selection boxes of sweets or chocolates are usually not too expensive and offer plenty of variety for different people’s tastes. Doughnuts or fancy biscuits are another popular favourite to share around the workplace. This can obviously be a little more expensive but a good option if you work in a fairly small office, and again there’s opportunity for plenty of variety.Remember if you do decide to get food products as a gift that some people might have special dietary requirements, meaning they end up being left out. Try and take this into account before buying a huge box of chocolates if some of your colleagues are diabetic, for example. Depending on your type of workplace, something to liven up those long, dull days can be a great option for a shared gift. It could be something simple like some posters to brighten up the walls or a selection of books and magazines for coffee breaks. If the rules in your office are a little more relaxed you could even consider buying a new radio or, if your budget allows, even a new TV to entertain your workmates. If you’re looking for a special gift and are feeling a little more creative, why not consider hiring an entertainer for an afternoon? You might arrange for a magician to come and wow your workmates with tricks, or even put a stand up comedian to the challenge of putting a smile on your boss’s face for once. 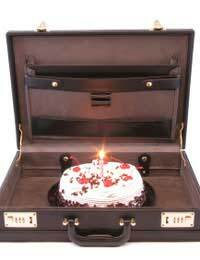 Again, this is a gift that depends on the occasion and the rules of your workplace so might be a good idea to run it past your employer before setting a magician or a troop of circus performers loose around the office. However, it’s a gift few of your workmates aren’t going to get a kick out of. Okay, so most employers aren’t going to be too happy if you have a little cat or dog running around the office, but that doesn’t mean you can’t have some kind of living thing for your workmates to help look after and appreciate. Goldfish are relatively easy to take care of and a nicely presented tank can look spectacular in any office environment. If goldfish doesn’t seem like a practical offering, why not consider some plant life instead? Most plants are even easier to look after and will brighten up the office no end. Something that doesn’t need watering everyday like a yucca plant is a good option, and they look fantastic too. If plants seem a little too boring, then why not consider what is known as a globus bio-sphere? At first glance the bio-sphere looks a lot like a sealed round fish bowl, filled with nothing but shells and some twigs. Look closer however, and you will see a mini ecosystem evolving before your very eyes. Little red shrimp require no feeding and the water need never be changed. All the bio-sphere needs is light and warmth for the algae inside to produce oxygen and food for the shrimp. In turn the shrimp produce carbon dioxide and nutrients for the algae to grow. This is a really fascinating gift and perfect for the office or workplace because there’s no need to worry about who’s left with the chores of feeding and cleaning.